Both teams desperately needed a win, with Ostersunds FK sitting on top of group J with 7 points, with Athletico Bilbao trailing in 3rd place (behind Zorya with 6 points) with just 2 points from the 3 games played so far. A win for Ostersunds would cement their position on top of the table, whilst a win for Bilbao would put them back into the running for qualification for the next round. Bilbao lined up in their eponymous 4-2-3-1 with veteran striker Aritz Aduriz chosen to lead the line, hoping to add to his 4 goals in the competition (and 4 in La Liga) so far. Young talent Inaki Williams will likely be one to watch, with his pace and trickery likely to cause problems for the Ostersunds defence. Ostersunds manager Graham Potter has received a lot of praise for how Ostersunds have approached the competition, holding Bilbao to a 2-2 draw and beating established European regulars like Galatasaray and PAOK. Potter makes a bold change to his Ostersunds team for this game, switching to a 5-4-1 formation. I’d heard plenty of good things about Ostersunds style of play, mainly how good they at using the ball, and their build up play. So I was a bit disappointed to see that this didn’t really come out much during the game. As the above picture shows, Ostersunds full-backs drop very deep to receive the ball short from the goalkeeper, whilst one of the centre-backs moves into midfield. The following video shows what happens immediately after. Bilbao press fast, putting the left-back under immediate pressure – forcing him to play the ball back to the goalkeeper. The press switches to the goalkeeper, who almost makes an error but manages to get the ball back to the left-back, there’s a quicker turnover in possession to Bilbao, who lose the ball forcing Ostersunds to clear the ball. Such a passage of play so early in the match (not even 2 minutes played) obviously shook the Ostersunds goalkeeper and formed the basis for the rest of the match. Practically every single goal-kick after that, the goalkeeper went long. However, the full-backs still dropped deep to receive the ball, allowing Bilbao to push higher up the pitch as you can see below. With the Bilbao defenders out-numbering the Ostersunds forwards and having the defensive advantage from such a situation, this just meant the ball went instantly back into Bilbao’s midfield, causing attack after attack. 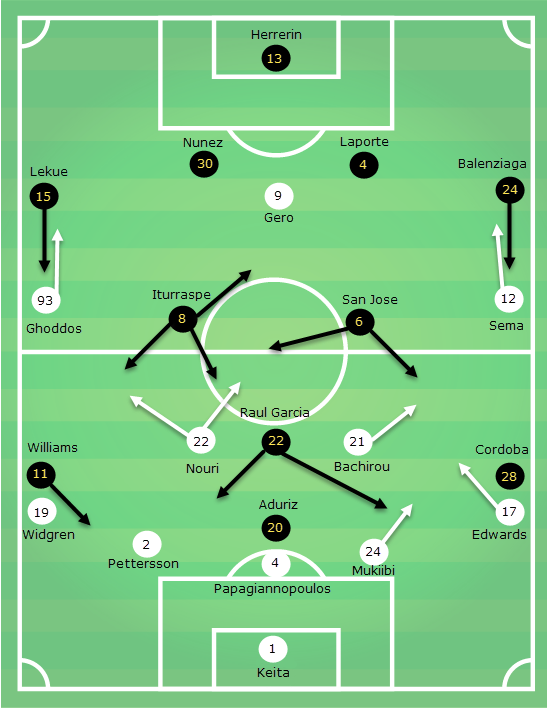 The change to Ostersunds’ formation didn’t help matters either, the shift to a back 5 meant they had to sacrifice a player from central midfield into defence, which meant the Ostersunds midfield was now outnumbered by the Bilbao midfield trio. The effect of this rippled up the pitch, with the lack of build-up play resulting in the Ostersunds attack seeing little of the ball. This is reflected perfectly by looking at the locations of every Ostersunds pass which you can see above (courtesy of WhoScored). Ostersunds have plenty of possession in their own half and down the flanks (which you’d expect from a 5-4-1 with wingers) but pretty much nothing in the key areas in the Bilbao half. When you compare this to the Bilbao map below, it’s easy to see why Bilbao dominated. The above pass-maps tell half the story, but the rest of the story is told via each teams shot locations. The lack of central creativity and build up play from Ostersunds meant that a majority of their shots were either outside the penalty box or from quite wide angles. In contrast, the Bilbao shots were largely taken from central areas, inside the penalty area. It’s little surprise that due to this dominance in practically every area, that Bilbao took the lead in the second half (with what would prove to be the only goal) thanks to Aduriz, who was first on hand to head home. If you’ve read some of my other analysis pieces, you’ll be aware that I specialise in set-pieces and the defensive set-up that Ostersunds took from corners really caught my eye, in my defensive corner analysis of Man City and Napoli, I noticed that both teams employed a zonal marking system, that consisted of 2 walls of players to help stop zonal markings biggest weakness – runners. By having a wall of players in front of a wall of players, you’re stopping runners from attacking the danger zone on the edge of the 6-yard box. As the picture above shows, Ostersunds line up with a few players on the edge of the 6-yard box, with a further line of players a few yards ahead of them to watch the runs of the Bilbao players sent forward. I had a look back through their corners faced this season and Ostersunds have used this system for the whole season (the Swedish season is due to finish this weekend), conceding just one goal in 127 corners faced – giving them an outstanding conceded rate of just 0.78%. Another highlight was that of Ken Sema. I’ll be honest and say I’d never heard of him before the game yesterday, but he was someone that drew my eye every single time he got the ball, and upon now researching him see that he recently made his first appearance for the Swedish national team. If he regularly puts in these sort of performances, I can’t see him staying in Sweden for too long. With 2 games of the group stages left, I’d back both teams to qualify for the later rounds, and it’ll be interesting to see if Ostersunds can put this display behind them and manage to get back to their entertaining brand of football.